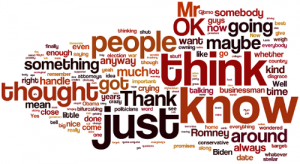 The Wordle on on the left — the one with “think” and “know”? — is Eastwood. And yes, the rumors are true: Eastwood really did use “bifurcating.” Twice. Also too “Gitmo.” Once. I wonder how many times Obama will use either of those two words in his speech? All of which suggests to me that Eastwood’s speech was a little more interesting than the torrent of meme-age instantly emitted from the cubes at Prudential Center in Chicago would suggest; I watched Eastwood live, and I found “the one humanly interesting moment of the convention” refreshing. So, first, I want to look a little at Eastwood’s speech; and then I want to look at the reaction of one D apparatchik to it. Not scripted, ad libbed, ums and ahs, yadda yadda yadda, and so what? Once again, it takes a loveable old coot like Eastwood — which is how this flap would be playing if Eastwood had given the same speech at the DNCon to an empty chair named Romney — to raise a question that neither candidate and neither legacy party will raise. I mean, if we won Iraq, where was the victory parade? And if there’s a reason to stay in Afghanistan, what is it? Afghanistan, graveyard of empires, and that. Bottom line for me is that both legacy parties now hate the guy, although for different reasons, which to me implies he’s worth taking seriously. To adopt another perspective, let’s label “Rachel”‘s style of technocratic discourse Inside Baseball. Much as baseball fans endlessly dissect statistics, trades, management decisions, Hall of Famers, etc., so D otaku generate endless permathreads on D sites — especially Kos, but it’s pervasive — on polling, messaging, positioning, money raising, phone campaigns, petition campaigns, advertising, who’s ahead or behind in this or that district, and on and on and on. But Inside Baseball isn’t for players; it’s for fans. Clue stick, guys: The operatives who are paid have these matters well in hand. They’re playing baseball; you’re playing rotisserie baseball. And wasn’t that the real story? That, for one brief moment, a speaker turned human asked some questions that both candidates, and both parties, find very unpleasant? Hey, when the Ds counter-strike and bring out Betty White for her star turn in Charlotte — kidding! — maybe she can bring up single payer? Or take a stand that not one penny should be cut from Social Security, Medicare, Food Stamps, or an other social insurance program? As long as she gets the timing right? NOTE * The spectacle of Romney’s campaign staffers running to the Times to leak their stories and save their reputations, if any, isn’t edifying either (assuming the quotes aren’t fabricated, a la the late, great Judy Miller). Further, if the staffers thought they’d have jobs after Election Day, presumably they wouldn’t be doing that, especially on the day after their boss got coronated. Do they know something we don’t? NOTE ** There’s a good deal of strategic hate management for elders running through the D anti-Eastwood meme-age. Useful when it comes time to throw the elders we all will one day be under the bus in a Grand Bargain! NOTE *** The attitude reminds me of the argument often made in the 2008 D primaries that Obama was best qualified to be President because of the excellence of his campaign organization. Besides the obvious question today — “How’s that workin out for ya?” — the argument seems premised on a category error in the same class as “The government is like a household,” or “The government should be run like a business.” In reality, the government is not a type of household, a type of business, or a type of political campaign, no matter how much reactionaries, business persons, and campaign operatives, respectively, would like it to be. NOTE I don’t pretend to know what was in Eastwood’s mind; all I’m doing is looking at what he said. Which the Inside Baseball types oddly, or not, just don’t get around to doing. I also don’t know if Romney asked the “sensible question” that Eastwood attributes to him; it sure doesn’t read like Romneyspeak, though. Still, it’s the question that matters, right? Not who asks it.